Naseer was nine years old when he escaped Taliban and fled Afghanistan. His story, “There are some people who are coming to take me away”, chronicles the resilience of a nine year old boy as he traveled from Afghanistan to America in his quest for the American dream. “I saw a ripe mango I’d like to pluck” showcases the love story of Chidibere and Ifeyinwa and their struggles with language, culture and being African in America. In the story “Kosovo, really...cool”, Lisian takes us through his journey to America and often being asked his identity in spite of being white. In the story “I am exotic, mocha, P-diddy”, Parag describes his journey from a young sixth grader who hid his attraction to boys in conservative India to embracing his sexuality in America. 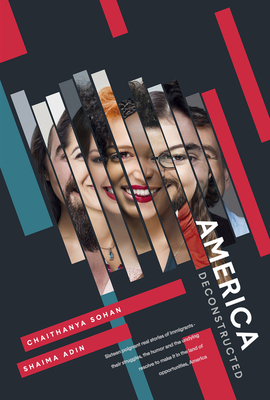 America Deconstructed follows the journeys of sixteen immigrants as they maneuver cultural differences, accents and uncomfortable situations while feeling a sense of belonging in America. Chaithanya Sohan has worked as a writer since 2002 when she started writing content for various websites. She free-lanced as a writer until 2013 when she decided to write her book America Deconstructed. She worked as a research manager and writer at One Earth One Mission for over four years during where she authored various pieces on political issues such as women empowerment and racial issue surrounding South Asians after to the September 11th attacks. Chaithanya Sohan and Denell Hopkins have been married for eight years and have one human child, Maya (Age 1) and a puppy child named Zed (1 1/2). In their spare time, they enjoy basketball, traveling and hiking the mountains. They live in Newark, California with her parents and two cats. Shaima Adin and Chaithanya Sohan met as new immigrants at San Jose State University while receiving their Electrical Engineering degree. America Deconstructed was born during those moments when they bonded through their mutual immigrant goof ups and experiences. Shaima Adin enjoys reading, traveling with her husband and daughter, and cooking during her free time. Chaithanya Sohan enjoys reading, writing and traveling with her husband, daughter and German shepherd puppy.